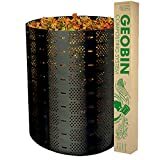 The Geobin Compost Bin is a simple, functional compost processing container that is an excellent choice for both experienced gardeners and newcomers alike. Its perforated, open-air design allows for fast composting, and plenty of air flow. The Geobin is expandable and flexible. Through the use of five interlocking keys, this plastic compost bin can enlarge to compost up to 216 gallons, or shrink to 112 gallons for smaller batches. Overall, the Geobin Compost system is one of the more budget-friendly composting bins on the market and should get the job done for its price – with a little bit of work. The Geobin can grow with your garden and your expertise! In this article, we will take a look at the various features of the Geobin Composting System, and consider who should look into purchasing it. Additionally, we will look at why it may be a better option than its higher-priced competitors. Keep reading for insights into the basic features, dimensions, aesthetics, functionality, and some useful accessories that go with it. Easy to assemble, and easy to use – simply use the 5 interlocking keys to change its size. Move and rotate contents to create fresh compost. Overall, this is a simple, mesh barrel design which lends itself to being able to be squirreled away into a quiet corner of any yard. Standing up to 3 feet tall, this compost bin is black in color and made of firm, solid plastic. For the price, the design doesn’t really get much better than this, for composters in this price range. Competing designs often have regrettably funky design colors, stick out in the yard, or just won’t be able to fit into the vast array of homes as this one will. The biggest benefit brought by the Geobin Composter is the flexible capacity, that can grow and contract with your needs. No need for a large bin, if you only have a small number of scraps at one time, and no need to purchase multiple bins as your compost grows. This is done with the included 5 plastic keys, which lock the bin in a specific size. Users simply line up the holes at a given position and insert the keys. Remove them to expand or contract the bin. As with any composting job, you want to make sure you add the correct ratio of green and brown to ensure success and overall speed. Carbon gives us the brown material, which could be anything from dry leaves, shredded paper, hay, and so forth. Nitrogen could come from your kitchen scraps, weeds, and expired vegetables. It’s important to balance these ingredients, along with oxygen and water, in order to hit just the right recipe to get the most out of this compost bin. The Geobin sits at about 3 feet tall, and it can expand as it gets filled up. Being plastic and exposed to the elements, one might think if its susceptible to heat warping or other damage, however, there has been little evidence that hot sun damages the system. As with many ground-based compost systems, the Geobin can attract small animals, bees, and insects depending on the material put in. Beware when filling it, moving it, or turning over the compost. If you’re concerned about critters and bees, you may want to lean toward a turnable compost bin like the Jora JK270 Compost Tumbler, which is situated above ground, and is difficult for insects and animals to penetrate. Overall, this composting bin seems quite durable to weather and nature. It weighs about 7 pounds and once filled, should have no problems maintaining form and staying put. There are, however, two common issues to be overcome with this composter. The first one is relatively easy: the lack of stakes. Any old plastic stakes from regular gardening should do. By inserting a couple of stakes, you can keep this bin properly anchored to the ground, even when there is little inside. The second issue is the attraction of animals, specifically pesky squirrels. The Geobin Compost Bin is thin plastic composter, so it is not squirrel-proof. Users have reported squirrels chewing through the composter regularly, even early in the compost bin’s life. That being said, for the first week or so of using it, one should keep an eye for any damage caused by critters or squirrels. If that isn’t an issue, expect this composter to last quite a while – most users report fine condition after 3+ years of service. Fresh out of the package being tightly rolled up, this bin can seem a little resistant to change. It comes with 5 interlocking keys used to hold it together and to adjust its size. Assembly is simple and easy. The biggest obstacle here is just fighting against the grain – the tightly rolled up plastic. Admittedly, it wasn’t that big of a challenge for most users, so compared to some other composters’ assembly requirements, this is walk in the park. In order to get the best out of your composting, first, you should get a decent pile in the bin for at least a few weeks. After it’s been heated and cured, proceed to empty the compost, leaving a little leftover of what’s been cured in order to speed up the process for the next batch. Another way, also effective, is to simply pick up the compost bin and move it to the spot right next to it. Using a pitchfork, one can move the uncured contents back into the bin (again leaving a little bit of the finished compost to help speed things up) while moving the rest to the desired location, such as a garden. Unless you are starting with a good 8-12” of composting material ready to go, it is highly recommended that you have some kind of tent stakes or garden stakes to secure this to the ground. The Geobin is prone to being knocked over by heavy winds, animals, etc. Users have reported older versions coming with stakes, and this is probably its biggest downfall – the stakes are almost as necessary as the compost itself in order to make this work. However, any old gardening stake will do, and others have reported success with tomato stakes especially. For most people, the Geobin is an excellent, inexpensive composting solution that efficiently produces high-quality compost. From its easy assembly to its simple sleek look, this composting system doesn’t take up a lot of space while fitting into most yards. Keep an eye out for the squirrels and other mischievous little critters, and this composting solution should last you at least a few years. Easy to assemble with closure keys. Easy to move. Easy to reassemble. Made from 50% recycled plastic content. The best value composting bin on the market.